Neisseria gonorrhoeae (N. gonorrhoeae) strains resistant to azithromycin and/or with decreased susceptibility to ceftriaxone are common in China, according to a prevalence study published this week in PLOS Medicine. The study, conducted by Yueping Yin of the National Center for STD Control & Chinese Academy of Medical Sciences & Peking Union Medical College Institute of Dermatology, Nanjing, China, and colleagues, also showed that the prevalence of dual resistance to these agents in N. gonorrhoeae isolates increased from 2013 to 2016. 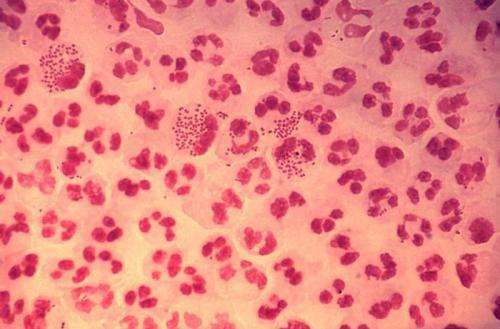 The results suggest that dual therapy with azithromycin and ceftriaxone, which has been recommended by WHO and many countries to treat gonorrhea, may not prove effective in China. Antimicrobial resistance in N. gonorrhoeae is a global threat in the control of this infection. China has a high rate of antimicrobial consumption, but has limited data on antimicrobial resistance in gonorrhea. In this study, minimum inhibitory concentrations (MICs) of azithromycin and ceftriaxone were determined for 3,849 clinical isolates from patients with gonorrhea who provided samples during the time period 2013 to 2016 in 7 provinces in China. Yin and colleagues found high prevalence of resistance to azithromycin (RTA; 18.6%; 95% CI 17.4%-19.8%) and decreased susceptibility to ceftriaxone (DSC; 10.8%; 95% CI 9.9%-11.9%) in the study population. The prevalence of concomitant RTA and DSC increased from 1.9% in 2013 to 3.3% in 2016 (chi-squared test for trend, P = 0.03). The study utilizes a convenience sample of clinical isolates, and most participants were symptomatic, heterosexual, residing in coastal locations, and male. However, to our knowledge this is the first national study on susceptibility of N. gonorrhoeae to azithromycin and ceftriaxone in China. The authors state, "It is important that clinicians be on high alert to recognize gonorrhea treatment failures so that they can be reported promptly to public health officials. The high and increasing prevalence of RTA/DSC found in the current study suggests the need for further consideration and validation of an appropriate regimen for treatment of gonorrhea in China."